School and police officials agree that most students want to do the right thing to keep their schools and neighborhoods safe but sometimes fear reprisals. We have Campus Crime Stoppers at all MISD secondary schools, Greenwood and Midland Christian secondary schools. We want the students to be able to report illegal activity without the fear of repercussion. The incentive to the student is a cash reward, as well as remaining anonymous. Or maybe you just see something that doesn't look right. A strange car. A person acting sneaky. MHS students produced a Campus Crime Stoppers video to show students that their choices matter in helping to make their campus safer. The goal of Campus Crime Stoppers is 100% safe schools. When a student submits a tip using the Crime Stoppers hotline or mobile app, they are Always anonymous and when a tip is submitted directly to a school official, they Always remain confidential. If a crime is solved, if there is an arrest or if a weapon is confiscated because of a tip, the student is eligible for a cash reward. REMEMBER .... It's Safe to Say....What You Saw, What You Heard and What You Know! The Board of Directors would like to thank Ms. Shadee Johnson's yearbook class for their hard work in helping to promote the Campus Crime Stoppers program. The video was shown at the MHS vs LHS football game on November 2, 2018. The Board of Directors presented Chief David Colburn with an appreciation plaque in recognition of his retirement from the Midland ISD Police Department. The Board appreciates Chief Colburn’s unconditional commitment in keeping our schools safe over the years as well as his cooperation and assistance with the Campus Crime Stoppers program! May the many years ahead bring you all joy and relaxation. Congratulations! 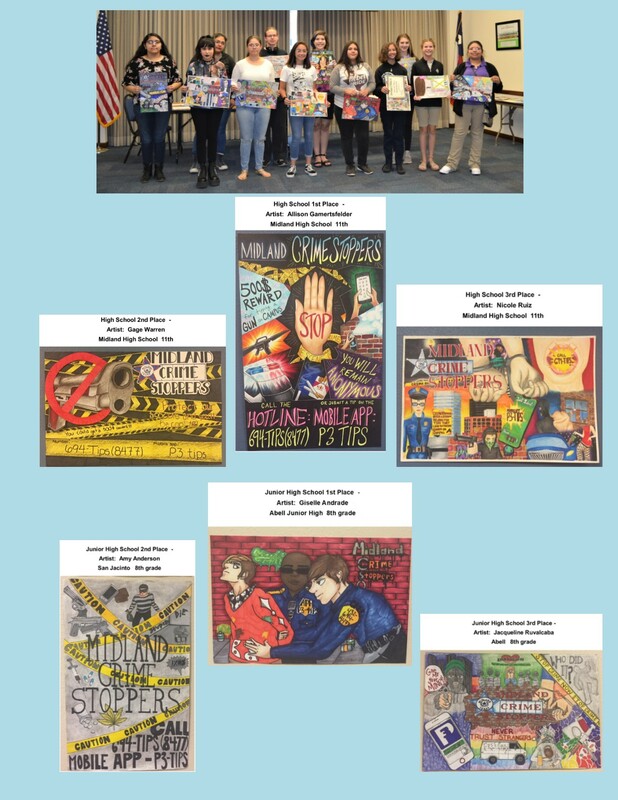 Congratulations to the winners of our 7th Annual Campus Crime Stoppers ‘Design the Poster’ Contest! Midland Crime Stoppers held a prize ceremony at the Midland ISD Central Office on May 22nd to present cash prizes to the 1st, 2nd and 3rd place winners and also presented 24 Honorable Mention certificates to 24 students. The 1st place winners in the High School and Junior High categories will be the ‘Official’ Campus Crime Stoppers poster for the 2018-19 school year. 286 poster submissions were received this year and we appreciate all the students who participated! GREAT JOB AND THANK YOU for helping us promote the Campus Crime Stoppers program! Thank you to the campuses that participated: Midland Christian, Abell Junior High, Goddard Junior High, San Jacinto Junior High, Midland Freshman High School and Midland High School!